When I say climbing, I don’t mean the kind you do with a dynamic kernmantle rope (ahem, Brian has a lot of gear in the garage). I mean the kind you do on a regular basis up the stairs and in the case of my children, on their new indoor playground. 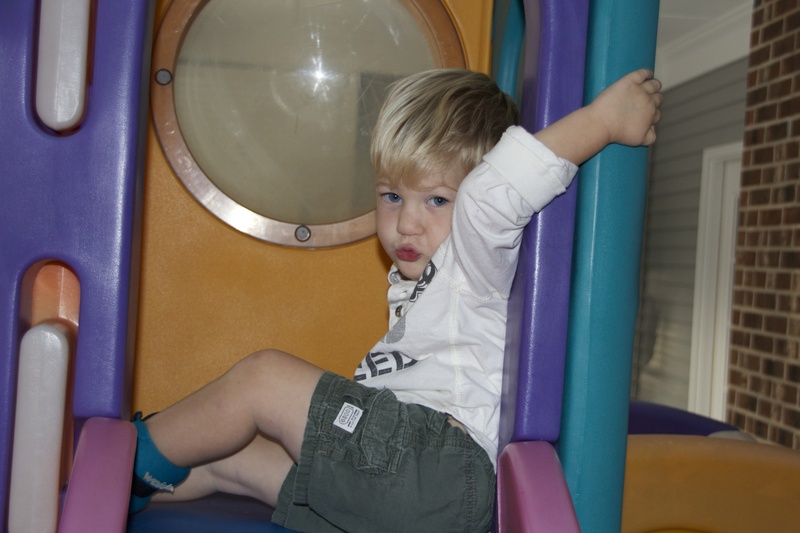 Case and Claire are blessed with enormously generous grandparents who shower them with toys and clothes constantly (to say they really do not want for anything would be a gross understatement)[we are so lucky -believe me I know!]. One set of grandparents the kids happen to live with and so the outpouring of love (or some might even venture to say ‘spoiling’) is done on a daily basis. 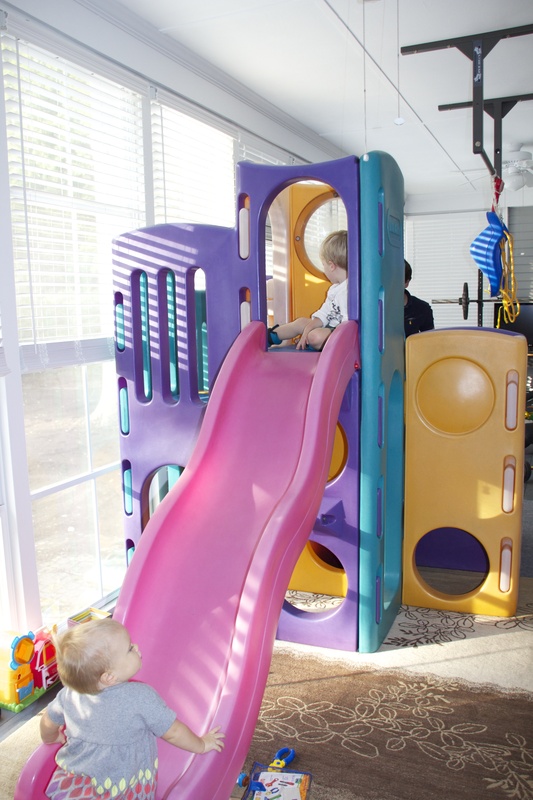 The latest toy/awesome gross motor tool that now graces my in-law’s back porch (turned playroom/workout room) is a giant, outdoor jungle gym. They found it on craigslist and actually happened to know the sellers from the YMCA (obviously) and bought it. The thing needed a major cleaning so Lee and I spent half a day taking it apart and giving it a thorough scrubbing (I mean, like lots of elbow grease and spiders). We then spent another half a day figuring out how to put the damn thing back together (exaggerating (a little)). Side note: I wish we had video of the two of us using a rubber mallet trying to slam this massive playset together – cue expletives. We finally did get it together again and the kids are all over it. 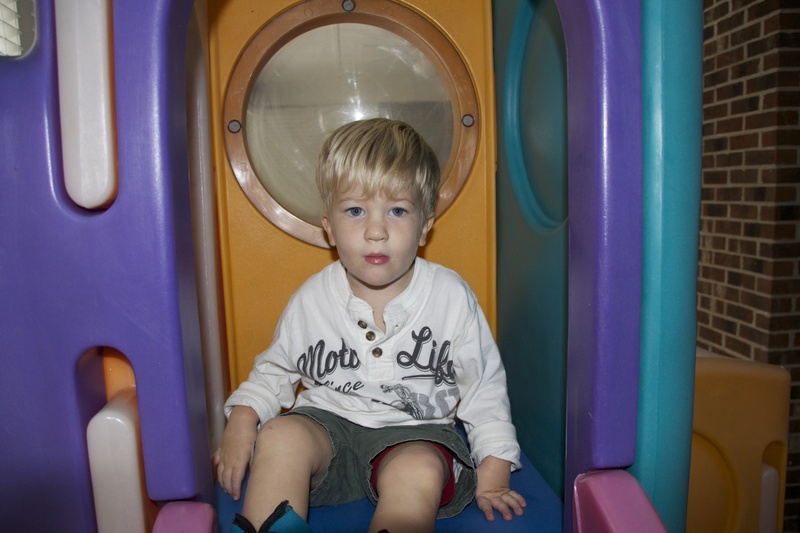 And, although it’s frowned upon at school (for safety reasons), we encourage Case and Claire to go up the slide. 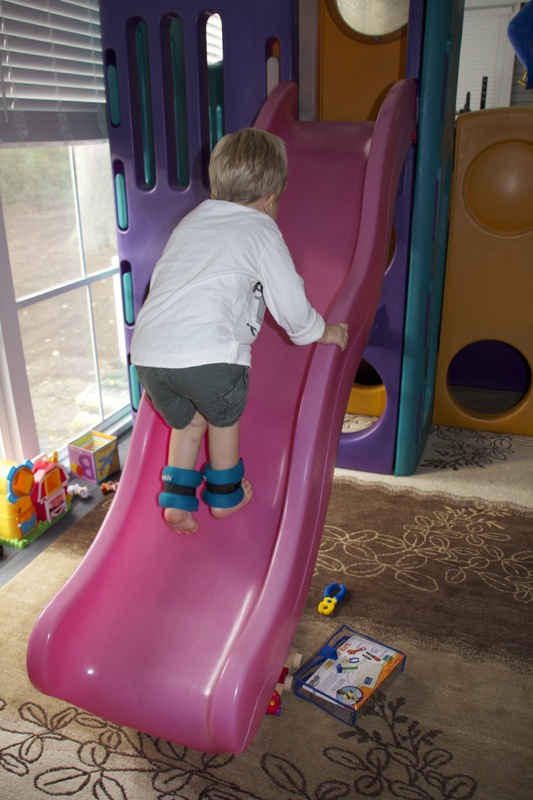 Like walking up a steep hill, it strengthens the muscles in your quadriceps (which are very weak on Case) and because the incline on this slide is really steep, he needs to pull with his arms to get all the way up. It has a tunnel which we have to bribe Case to go through as his weak hip flexors make it difficult for him to pull his legs up into it and then putting all the weight on his arms to get out is equally challenging. Perhaps you’ve already guessed what we’re using as a bribery tool… I can’t help but buy a bag when its staring right at me at the checkout line in Target and the kids can’t help but want it (Brian too). Terrible thing, this holiday we call Halloween! But using small pieces of candy is incredibly motivating for Case and so I vow to myself to brush his teeth a little longer each night if he makes it through the tunnel two more times or up the stairs without as much fuss. 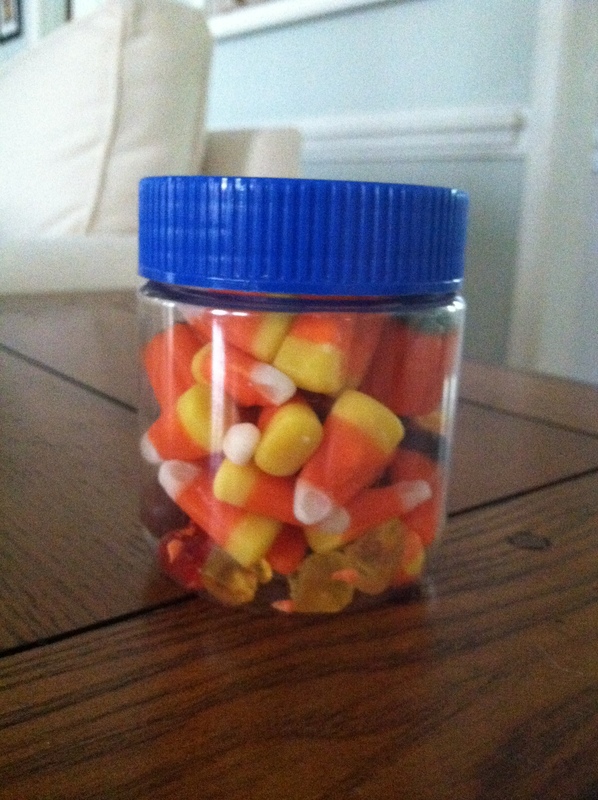 Side note: We also use candy corn as a reward for going on the potty (I refer to it as peepee candy – appealing, eh?). We put it in the zipper closure ziplocs and make Case open and pull “one” out or we also have an old bouillon cube container with a screw on lid that we make Case hold and unscrew (this is still pretty challenging). You may notice in the photos that Case has things around his ankles. Although it could be some sort of odd fashion statement (not sure what the statement would be), they’re actually just 1lb weights which we’ve been putting on him when he’s around the house to help strengthen his legs while he does every day activities. He’s getting around much better in them and I’m thinking of upping the weight to 1.5/2 lbs. Case minds them a little but doesn’t have the fine motor aptitude yet to undo the rather strong velcro and pull them off his heels so he’ll endure it until he masters that skill (and I’ll be proud when he does!). Finally, I had to share a few recent photos of Claire in honor of her first birthday. 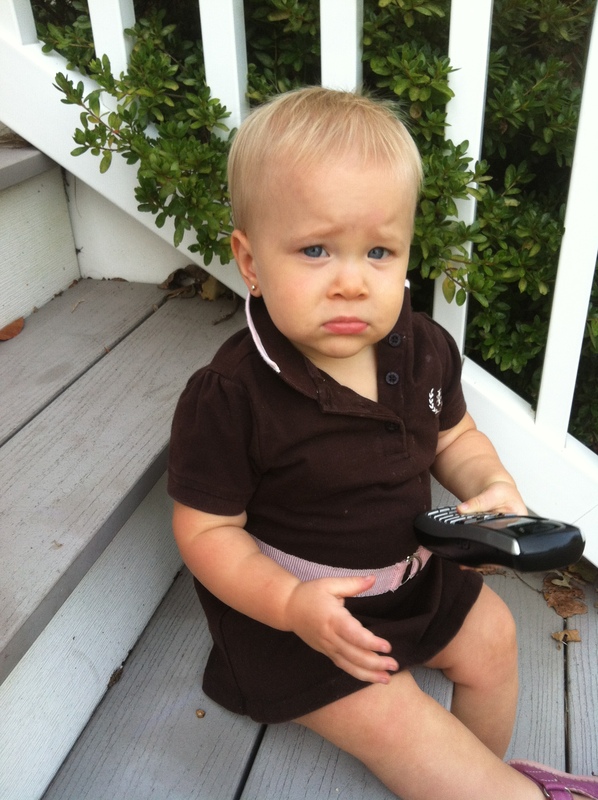 The photo where she’s holding the landline phone perfectly captures the ever-present ‘tude that this girl has ALREADY. We are in for it, I’m afraid! 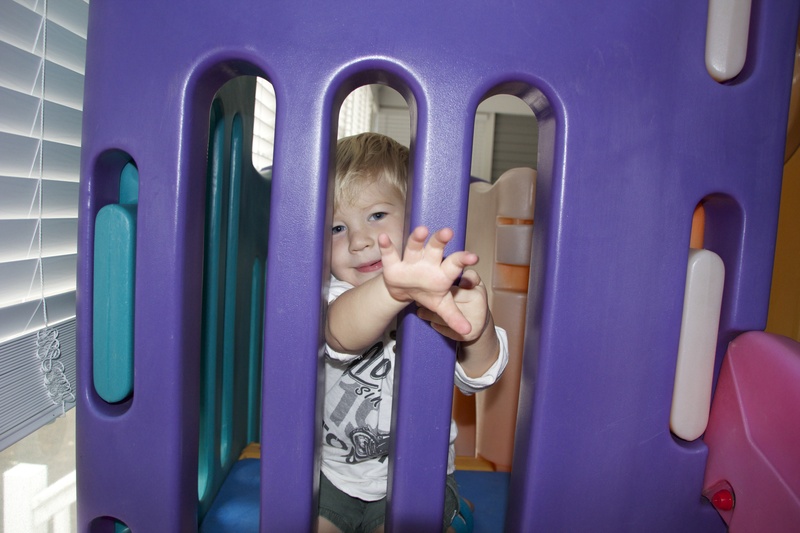 The other photos are of her newest trick which is to play peekaboo with her hands over her eyes. She showed off all her new tricks at the doctor’s office (labeling body parts to the head, shoulders knees and toes song and repeating almost all the words Case knows!) on Wednesday for her well-baby to which her smitten doctor echoed me in saying, “Uh oh, Brian is in for it with this one!”. She is certainly a spitfire, but every time I begin to think how can I parent two totally different children I remind myself that she is the perfect prescription for Case. He’s got a little sister who won’t take no for answer and who is going to stick up for her brother tooth and nail. 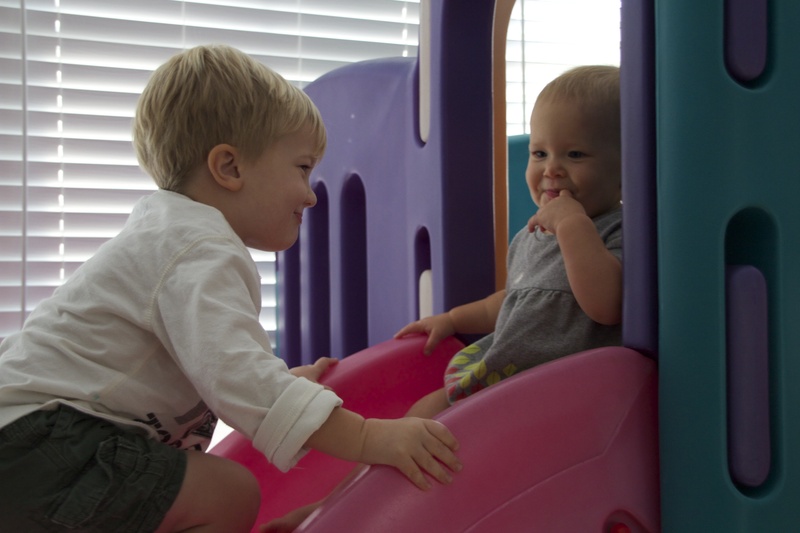 Not to mention that Case now goes up the slide willingly because Claire does it first. In our house, a little competition is definitely a good thing!